Delicious pan seared scallops are paired with saffron and cream for an appetizer that screams luxury and decadence. Perfect for Entertaining. As we approach this special time of year this recipe for Pan Seared Scallops with a Saffron Cream Sauce is a real wow dish. With such a delicious treat you don’t want to mess about with them! I am not going to be adding scallops to complicated dishes where I could ruin the scallop or lose the beautiful sweet flavour. Pan seared scallops, a splash of wine, a pinch of saffron, some butter and a good dollop of cream. Delicious, decadent and luxurious. Seared scallops with a creamy saffron sauce has to be the perfect appetiser for Christmas? And look how beautiful it is. Just looking at these pictures makes my mouth water. I am daydreaming about pan seared scallops as I type!!! 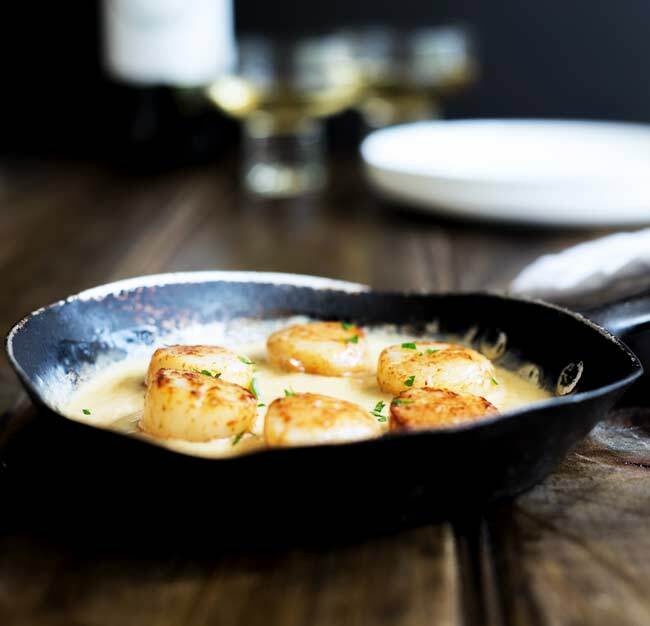 The recipe uses 12 large scallops; by serving up 3 scallops each, at the start of a delicious meal, you can serve 4 with this recipe. With a dinner roll you could serve 2 each and feed six people. 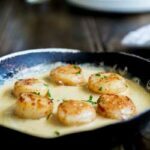 If you love this recipe for Pan Seared Scallops with a Saffron Cream Sauce why not pin them for later. Delicious scallops are paired with saffron and cream for an appetiser that screams luxury and decadence. Perfect for Christmas and entertaining. Remove the scallops from the packaging and place them on kitchen paper to ensure they are dry. Place the half of the butter (1/4 stick/30 g) and the olive oil into a non stick frying pan and melt over a medium high heat until it is starting to foam. 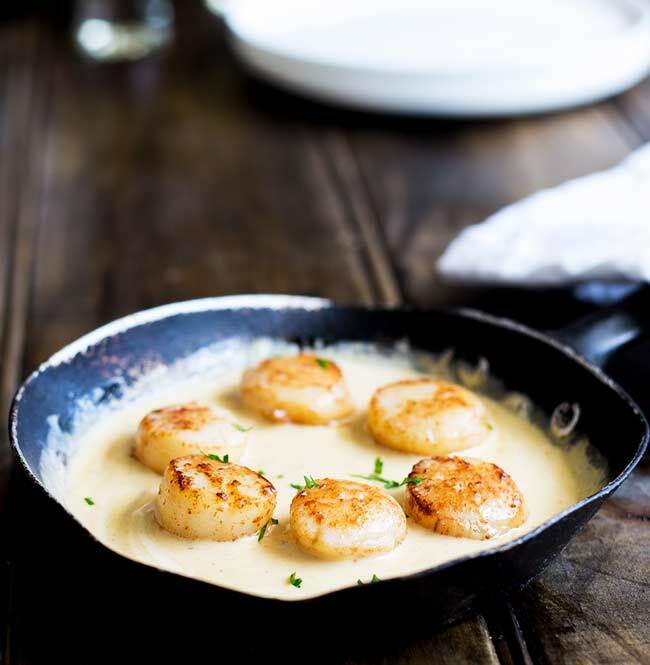 Think of the frying pan as a clock and add the scallops to the foaming butter starting at 12 o'clock and then working around clockwise. Cook over a medium high heat for 1 1/2 minutes until golden brown. Carefully, starting at 12 o'clock again, flip the scallops and cook for a further minute. Remove scallops from pan (starting at 12 o'clock again) and place them on a plate near the hob. Turn the heat to high and add the wine to the pan. Allow this to bubble for a couple of minutes, then reduce the heat and add the saffron. Stir well and whisk in the remaining butter (1/4 stick/30 g). Once this has melted add the cream and whisk until slightly reduced and thickened. Return the scallops to the pan and serve garnished with parsley. 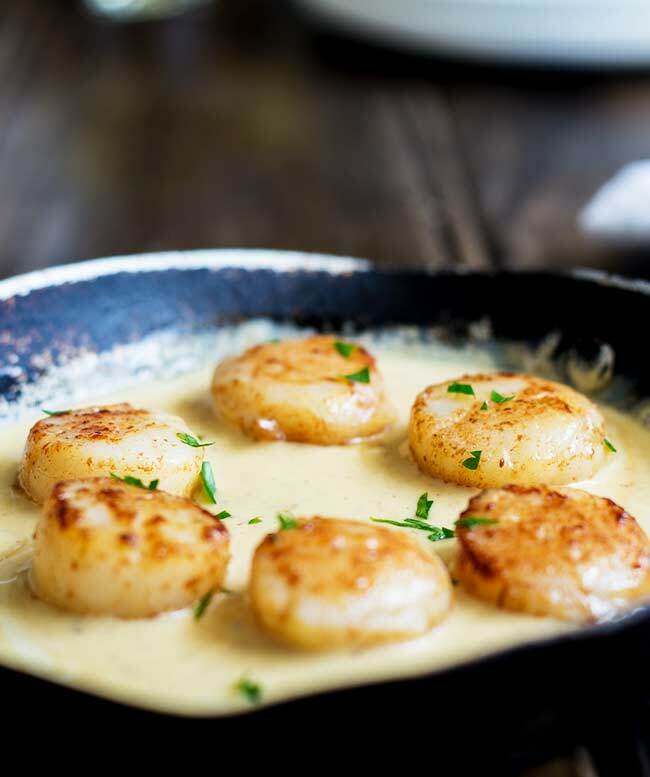 If you love food why not subscribe to my newsletter, I will drop you an email every now and then, just to say hi and send you a couple of recipes think you might love, like these Pan Seared Scallops with a Saffron Cream Sauce. OH, MY GOODNESS!! I’ve been searching for a perfect saffron cream sauce, especially for seafood, and I finally found it. I cook, a lot! I cook gourmet type dinners, a lot! My husband and I are definitely “foodies”. 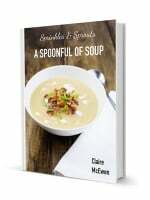 And this recipe…both my husband and I could not stop saying how good it is/was and both of us just wanted to keep eating! I added Argentine prawns, along with scallops, and served this over angel hair pasta. I doubled the sauce recipe since I added prawns, but didn’t double the olive oil. I also seasoned the scallops with a little sea salt and pepper. This is DEFINITELY a keeper!! Thank you!! I am just drooling over your dinner. The prawns and pasta sound like the best additions….Seriously drooling. I made it as an appetizer when my parents came to stay. They have taken your website home. I think my Mom will be a life long fan!!! I am so happy to read this Gill, thank you for coming back to comment. Mine too 🙂 I could eat them everyday! !